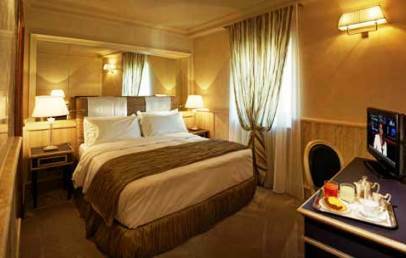 The romantic 4-Star Hotel Barocco looks out onto Piazza Barberini, in Rome's magical historic centre. The Hotel has a beautiful view of Bernini's Triton Fountain, and is ideally located for visiting many of Rome's most beautiful sights. It's a pleasant three-minute walk from Piazza di Spagna, the Trevi Fountain and the shopping streets, and if you feel like walking just a little further, you will find yourself admiring the imposing beauty of the Pantheon. The “Barberini–Fontana di Trevi” underground station is just opposite the Hotel and is a convenient way to visit the Eternal City. Every area of the Hotel Barocco, a converted six-floor historical building, is remarkable for its absolute cleanliness and attention to detail. Refurbished in 2010 and renovated again in 2012, it has elegant rooms and a charming atmosphere of bygone times, precious details and all the comforts of modern technology. The hotel has 41 rooms, located in the main building and an annex, with a charming breakfast room and the elegant Barolo Bar. The rooms at the Hotel Barocco are quiet and romantic, decorated with warm colours and featuring precious traditional Italian materials. All rooms, regardless of the type, have soundproof windows, "extra comfort" mattresses with memory foam topper, desk with a lamp, wardrobe, free Wi-Fi, mini bar, safe, satellite TV, marble bathroom with bathtub or shower, hair dryer and complimentary toiletries. 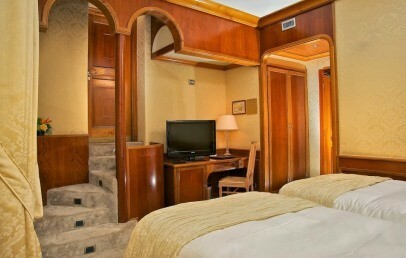 Classic – 14 sqm, double bedroom, bathroom with shower, view of Via Purificazione or internal courtyard. Superior – 16-18 sqm, double bedroom (with double bed or twin beds), bathroom with shower, view of Via Purificazione or internal courtyard. Deluxe – 20 sqm, double bedroom (with king-size bed or twin beds), bathroom with shower, view of Piazza Barberini or Via Purificazione or internal courtyard. Junior Suite Terrace & Love Pool – 23 sqm, double bedroom, bathroom with chromotherapy shower, terrace with hot tub for two, views of Piazza Barberini and the Tritone Fountain. Junior Suite Light & Sight – 26 sqm, double bedroom with king-size bed, bathroom with shower, balcony overlooking Piazza Barberini and the Triton Fountain. Suite – 32 sqm, double bedroom with king-size bed and separate living room, possibilty to add a single bed for a child up to 10 years (the living space will be greatly reduced), bathroom with bathtub and chromotherapy LED mood lighting, overlooking Piazza Barberini and the Tritone Fountain. Rooms within the same category have different layouts and features that make each one unique. On request, Superior, Junior Suite and Suite rooms can accommodate baby cots for children up to 2 years (available free of charge). From 7:00 to 10:30 (11:00 on Saturdays and Sundays), you can enjoy a well-assorted buffet breakfast with traditional fresh produce and sweet and savoury dishes. On request, you can enjoy continental breakfast in your room. At Hotel Barocco's Barolo Bar, open from 16:00 to 23:00 h, you can enjoy great drinks, and on occasion attend book presentations and delicious food tasting events. If you need advice on where to eat, the concierge at reception can suggest the best restaurants in Rome. The hotel's 24 hour reception service and its numerous staff will make sure your have all you need during your stay at the Hotel Barocco, and will be happy to provide information and offer assistance to book visits to sights, monuments etc. A train ticket office is close to the Hotel. Buffet breakfast and Wi-Fi are included in the room price. There is a private car park nearby (approx. € 40 per night, to be paid at the car park) and a public car park is 15 minutes away on foot (approx. € 18 per night). Valet service is not available. Please note that, due to the number of steps and stairs, the Hotel Barocco is not particularly suited for guests with disabilities. The lift (which doesn't reach every floor) and room doors allow access to standard non-motorised wheelchairs. Tourist tax – The municipality of Rome charges a tourist tax to be paid at the hotel (the tax doesn't apply to children under the age of 10). 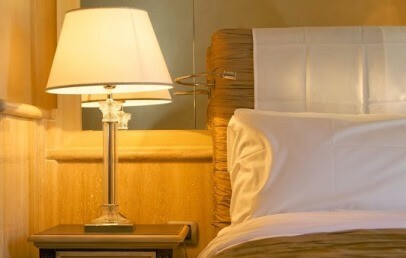 Romantic double bedrooms decorated with warm colours and Made in Italy materials and furnishings. They feature "extra-comfort" mattresses with memory foam topper, desk, complimentary Wi-Fi connection, wardrobe, minibar, safe, satellite TV. The bathroom has a shower, hairdryer and complimentary toiletries. The windows ara soundproofed and the view is over Via Purificazione or on a internal part of the hotel. 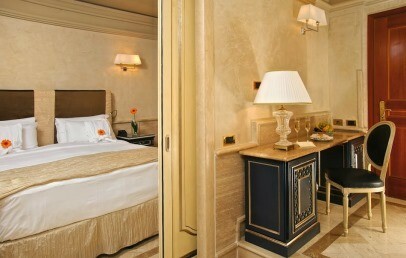 Romantic and spacious double bedrooms decorated with warm colours and materials and furnishings Made in Italy. 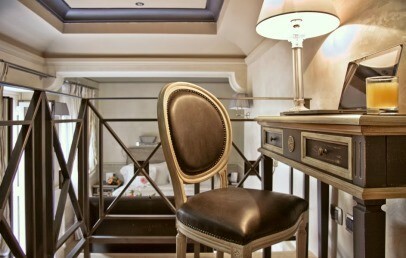 They feature "extra-comfort" mattresses with memory foam topper, desk, Wi-Fi connection, wardrobe, minibar, safe, satellite TV. The bathroom has a shower, a hairdryer and complimentary toiletries. The windows ara soundproofed and the view is over Via Purificazione or over an internal part of the hotel. The availability of Superior rooms with twin beds is limited: if you want twin beds, please specify when booking or we might be unable to satisfy your request. This accommodation can host a baby bed. 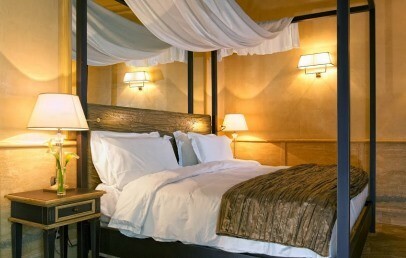 Romantic and spacious double bedrooms decorated with warm colours and Roman travertine finish, some have a canopy bed. They feature "extra-comfort" mattresses with memory foam topper, desk with a lamp, wardrobe, mini bar, safe, satellite TV and en-suite bathroom with shower or bathtub, hair dryer and complimentary toiletries. Soundproof windows, view of Piazza Barberini or Via Purificazione or internal courtyard. Availability of Deluxe rooms with twin beds is limited: if you want twin beds, please specify when booking or we might be unable to satisfy your request. Bright and romantic double bedrooms featuring en-suite bathroom with a shower, hair dryer, slippers, bathrobes and complimentary toiletries. They have "extra-comfort" mattresses with memory foam topper, desk with a lamp, wardrobe, free Wi-Fi, mini bar, safe and satellite TV. 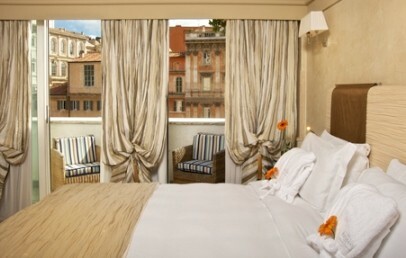 The Junior Suite Light & Sight opens onto a balcony overlooking Piazza Barberini and the Triton Fountain. Open-space suites with a warm and welcoming feel, featuring a double bedroom, relaxation area and bathroom with chromotherapy shower, hair dryer, slippers, bathrobes and complimentary toiletries. All have "extra-comfort" mattresses with memory foam topper, desk with a lamp, wardrobe, free Wi-Fi, mini bar, safe and satellite TV. The Junior Suite Terrace & Love Pool opens onto a terrace with a hot tub for two, overlooking Piazza Barberini and the Triton Fountain. Suites with a warm and welcoming feel, featuring a double bedroom with living room, en-suite bathroom with bathtub and chromotherapy LED mood lighting, hair dryer, slippers, bathrobes and complimentary toiletries. They have "extra-comfort" mattresses with memory foam topper, desk with a lamp, wardrobe, free Wi-Fi, mini bar, safe and satellite TV. Soundproof windows, overlooking Piazza Barberini and the Triton Fountain. Possibilty to add a single bed for a child up to 10 years (the living space will be greatly reduced). 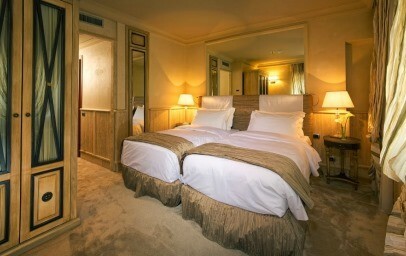 The single rooms at the Hotel Barocco have a French-size bed, an ideal accommodation for a single traveller. They have a desk, wardrobe, complimentary Wi-Fi connection, minibar, safe, satellite TV. The bathroom has either a shower or tub, hairdryer and complimentary toiletries. The windows ara soundproofed and the view is over an internal part of the hotel. These rooms can host up to only one person.